Football loving PC gamers don’t realise how lucky they are. For the past 20 years they’ve had access to a series of consistently brilliant management games, allowing them to experience the challenges, joys and frustrations of managing a top-level football club. But what about console gamers? Sure there have been attempts in the past, and pretty good ones, but there’s also been a lot of yawnsome toss. So up steps Premier Manager 2012, aiming for the top corner. But early reviews were fairly negative, pointing out that the time each game took ruined the flow of the game. Well, we held fire on our review, gave it some extras hours and waited for the inevitable update. And sure enough, version 1.01 has arrived with a key change that might just rescue Premier Manager from an embarrassing early cup exit at the hands of Burton Albion. Your first sessions with the game don’t give you much hope. The menus themselves are similar in design to the PS3′s XMB and finding the options you need can be tricky while you learn your way around. It’s also sometimes difficult to work out how to do various things; even advancing to the next day took 5 minutes to figure out after the first time I ventured away from the home screen. The controls are oddly mapped as well, with the circle button advancing the game and R1 bringing up the main menu – when we’re used to circle taking you back, it’s weird having to use it to advance the game. But once you’ve taken the time to work out how everything works, it’s easy enough to zip through the menus, setting your team up and hunting for players to improve your squad. The transfers themselves are easy enough to carry out, although the searching options and transfer process is extremely streamlined, giving you only the basic options. 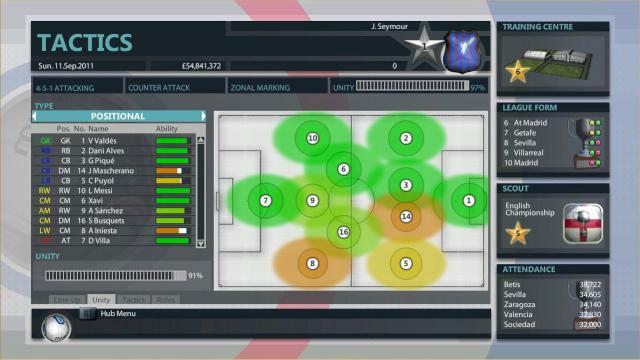 Match tactics are a similar story, with a few options easy to change (formations, attacking bias, passing style) but impossible to fine tune, but this in itself isn’t a huge issue. Console gamers generally aren’t after the same experience as PC fans, and if you’re used to playing games in bursts of an hour or so then this slimmer structure will suit you perfectly. Something that makes life harder is the background music. It’s bad. Really bad. Not in the same way as being forced into a 24 hour Robbie Williams-athon, just in a very repetitive, boring “please stop” way (actually that is the same thing…). 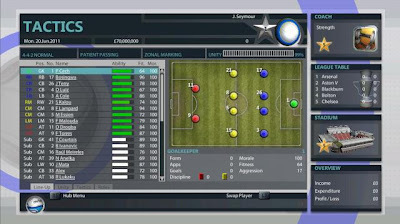 If the option was there to listen to your own background music from the XMB then it would make Premier Manager a very relaxing experience, combining laid back and casual management with some music time, but there isn’t. You can turn the music off totally (phew) but it’s not the ideal solution, especially considering there must be plenty of system resources available while the game is running. The rest of the game’s sounds are functional bongs, swooshes and more bongs that do a job but will hardly pick up awards, so it’s probably worth just turning the sound off completely and putting the radio on. But what of the matches themselves? Well, they’re slow. Even with the match speed set to “Fast” you’ll be watching each one for good couple of minutes, and the engine used to watch each game isn’t exactly flushed with detail. The pitch view is too small to be helpful, and the commentary is just a list of shots, bookings and goals. Hardly enough to judge how the match is going. They’re a bit of a waste of time really, and apart from making the odd substitution you might as well use the saving grace that 1.01 offers: the “Result Only” option. After updating, you can now head into the menu and turn on an option that allows you to skip the match completely and just see the result. You still get to see stats of the game and player ratings, so you can see if your new signing is performing or if the new formation worked out well. You just don’t need to sit and watch a game play out that you can’t, in any way, speed up sufficiently or have much control over. It’s a game changer. Instead of sitting down and playing a few matches you can now rattle through half a season easily in one sitting. The limitation of the game are still there; they haven’t changed the music, added more depth or found any official licenses hiding down the back of the sofa, but the flow of the game has increased considerably, even if it detaches you a little from the action. But then there’s the issue of the price. If Premier Manager 2012 had a bargain price tag it would be easy to recommend to people after a bit of light-hearted, accessible managing, but it’s £13.99 which, by PSN standards, is a chunky request. And is there really enough here to spend that much money on? I’m not sure. It’s not a bad game by any means, but if you’ve got access to a reasonable PC then there shouldn’t be any competition on which way to look. It’s one of those games where someone asks you if it’s any good, and you just shrug and say “yeah it’s alright, not bad, not great…”. Worth looking into if you really fancy some management on your PS3 (especially with the new update) but it’s a lot of cash if you’re just a bit intrigued. So Premier Manager 2012 got past the tricky 1st round tie, but ended up losing on penalties to Walsall. Maybe next year, eh?